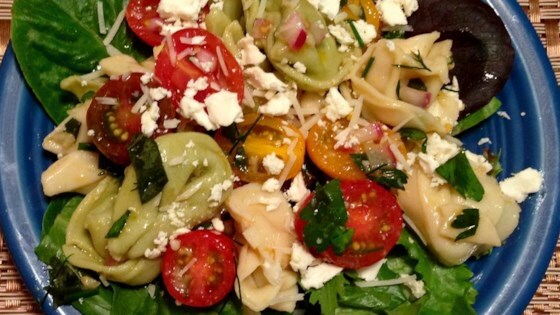 "Fresh herbs and lemon juice give this cheese tortellini the refreshing flavor of summer. It is a wonderful dish for picnics. Ideas for variations: garbanzo beans, green peas, grated carrots, and/or broccoli flowerets." Cook pasta in a large pot of boiling water until al dente. In a jar, combine vinegar, olive oil, fresh herbs, lemon juice, garlic powder, and hot sauce. Seal, and shake until well mixed. Season to taste with salt and black pepper. In a large bowl combine, tortellini, peppers, onion, and olives. Pour lemon dressing over salad, and toss to coat pasta. Cover, and chill for at least four hours. Before serving, toss in feta and Parmesan. This creamy pasta salad is the perfect side for picnics, potlucks, and BBQs. Great salad, colorful too. I added more basil. I brought this to a potluck, and it was very popular. I add 4 plum tomatoes and 1/2 c balsamic vinegar to this terrific recipe. Great as leftovers for lunch.